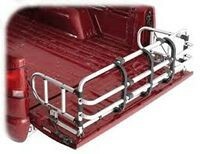 Pickup Bed Rack Truck & Car Racks from Proline: Thule Racks, Yakima Ski Racks, Bike Racks Canoe and Kayak Racks Cargo Carriers and Truck accessories. Topline Universal bed expanders BX4004-01, and BX4004-02. Durable 450 lb capacity, height adjustable, aluminum construction.